The trains between Brighton (South East England) to London (London England) are operated by Gatwick Express, Thameslink, Southern. The services on board may change depending on the train operator. 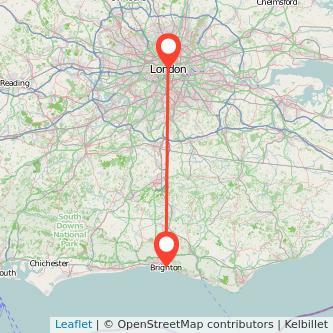 There are 47 miles between the two cities and the average duration between Brighton to London is around 1h17m. Train travel is most of the time the quickest way to travel to London from Brighton, and it's also more environmentally friendly than driving or taking the plane. The cheapest fare we've found for the next 30 days is £5.00 one way. Find the cheapest tickets to travel from Brighton to London by train, bus, ride sharing and plane. Based on our data, 18 trains from Brighton to London are available today and 0 tomorrow. The first Brighton London train leaves at 06:57 and the last one leaves the station at 17:33. The first and last departure times can vary every day and there can be fewer services during weekends as well as public holidays. Rail operators may also adjust the number of trains during school holidays or depending on the season. The Prices for train tickets Brighton to London tend to increase the closer you get to your departure day. Based on our data, if you purchase your ticket 1 month in advance, the price of the ticket starts at £6 whereas when booking on the day you're travelling, you will need to spend at least £15 for your trip. Thus, you will save 64% on the price of your ticket by buying your ticket 1 month in advance as opposed to on the day you're travelling. We compare train ticket for all major companies to travel between Brighton and London by train and find the best prices for the coming days. Take a look at the prices of train tickets London to Brighton and find the best deal for your outbound journey. Do you want to travel at the lowest fares? Many railcards and tricks can be obtained to spend less for your Brighton London train ticket and save even more money on your tickets: special train fares for children, railcards for all ages, group travel, or charity discount. There are different types of railcards available: 16-25 railcard, Two together railcard, Family and Friends Railcard, Senior railcard, Disabled persons railcard. You will need to purchase at least £88 of train tickets throughout the duration of the railcard's validity for the card to be worthwile. This number corresponds to the cost of the railcard, £30, divided by the discount, 34%. On every ticket that you buy afterwards, you will save money. As an example, train tickets from Brighton to London cost on average £17.75 (1). If you're dividing £88 by £17.75 (£88/£17.75 = 4.96), it turns out that after only 5 one way journeys from London to Brighton, the railcard will have paid for itself.